Not since the time that it cemented itself into a part of society’s consciousness with the publication of Tom Brown’s Schooldays by Thomas Hughes in the mid-nineteenth century has sport ever been more at the mercy of dark forces in this world (fear not, this is no quasi-tribute to Star Wars). 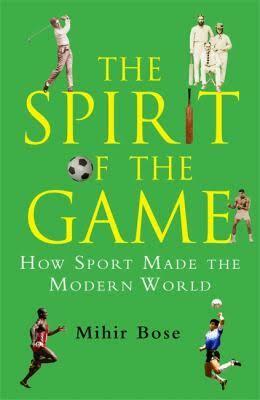 In the final chapter of his brilliant book called ‘The Spirit of the Game- How Sport made the Modern World’ (Constable, 2012), Mihir Bose tells of a revealing anecdote about a U.S. Presidential candidate that was recorded by the famed gonzo journalist and writer Hunter S Thompson: ‘Whatever else might be said about him- and there is still serious doubt in my mind that he could pass for Human- he is a goddamn stone fanatic on every facet of pro football’. Here, Thompson was making reference to Mr Watergate himself, Richard Milhous Nixon. Even though gridiron in America thankfully emerged unscathed from the attentions of Nixon, sport did of course endure real threats to its integrity during the twentieth century. From episodes like the 1919 World Series Baseball fix and the resultant “Say it ain’t so, Joe” plea from a young fan to ‘Shoeless’ Joe Jackson, to Hitler using the 1936 Olympics to promote his Nazi-ism, and decades later, to the systematic programme of drug cheating in East Germany, in complicit accordance with government officials. However demeaning to sport these incidents were though, there has now emerged a problem so all-encompassing that it is entirely possible the very nature of professional sporting contests in the future are going to be subjected to the most unrelenting of scrutiny, be it from the gaze of the everyday fan, to growing numbers of high-powered investigations and testing programmes launched by concerned organisations and governments. This problem is of course the scourge of corruption, bribery (could the last one left at FIFA please turn out the lights), illegal gambling and match-fixing and the seemingly exponential use of banned stimulants across not only elite sport, but even more so it now appears, at the semi-professional level. Aside from its competitive element, the beauty of sport lies in its abandonment and its ability to influence people in adapting mantras or beliefs that they are able to apply to other spheres in their lives, such as ‘Play hard, but fair’. The public trust high-achievers and leaders in sport. Our own country is a relevant example. It’s an almost sure-fire bet that Richie McCaw would far out rate the Prime Minister in any popularity contest. But public adulation and respect might soon diminish rapidly if sport continues to be tainted by those manipulating it for their own ends. That things have gotten as dire as they appear to have though, should come as perhaps little surprise to anyone with at least a passing interest in competitive sport. One only need look at the sorts of figures generated by sport globally to realise that it was only a matter of time before a multitude of nefarious parasites worked out there were small fortunes to be had by building pyramid-type, cash laundering empires, where middle men and lackeys are sent to shadowy hotel rooms and dark alleys to fix deals with whoever can be ‘bought’. The amount of greenbacks being generated by sport worldwide is truly scary. In his aforementioned book, Bose relates that as far back as 2004, a study by the consultancy A.T. Kearney put the value of the United States sports industry (not even including player salaries) at already double that of its automotive industry. Even more frightening is the value placed on the global sports market. Three years ago, this figure stood at somewhere between $480 to $620 billion USD. – in other words, 48,000- 62,000 million dollars. A figure we are told that is roughly equivalent to the entire Gross Domestic Product of one of the planet’s wealthiest nations, Switzerland. The figure does not even include capital generated from the health and fitness industry. When this is factored in, ‘the sports industry generates as much as $700 billion yearly’. (Winning in the business of sports: A.T. Kearney, 2014). Little wonder then that the starving would be tempted by stealing a slice or two of a very big cake. At the nub of the matter though, is the rule of law. Whether one agrees or not with the frequently obscene amounts being made out of a once noble pursuit, and some of the means by which some people or corporations may or may not secure be securing their profits by; the fact is that aside from the illegalities of gang lords engaging in money laundering and fixing from sporting fixtures, the even bigger issue at play is that the age old tradition of a contest is being tampered with- namely, the result- the winner and the loser. In the bribery/fixing scenario, millions of fans are cheated out of their money and the natural outcome, having paid up to view a match in good faith. This is surely the biggest reason why, as sports fans, we should feel so violated by this criminal behaviour. We should be worried, very worried for sport’s future integrity. Just recently, news broke of 2.4 billion dollars being bet on last season’s Australian Big Bash cricket league. You would have to believe the earth was flat and be on the bus to la-la land if you didn’t stop to think that at least some part of that sum was not being wagered under the pretence of conditions existing completely above board. It is now literally the end of 2015 and the subject of sports morality and blatant cheating is still a hot one, if coverage over the last few months from some media outlets is any indication. However, it isn’t like we weren’t warned before that such goings on have only been getting worse. Last year, in a report by ‘The Telegraph’ from the annual Securing Sport conference in London, outgoing Head of Wada (the World anti-doping agency), New Zealander David Howman contended in a keynote address that: ‘now, organised crime controls at least twenty-five percent of world sport in one way or another…these guys who are distributing drugs, steroids and Human Growth Hormone and EPO and so on, are the same guys who are paying people to fix games. They’re the same bad guys’. As of this year however, Howman’s pleas for a wide-reaching integrity unit have still to come to fruition. It only demonstrates that for all Wada and Howman’s crusading and vigilance, there remains an Everest-sized mountain still to climb to clean up sport. It is a task almost too big to contemplate when you consider that you cannot even rely on governments to endorse, let alone co-operate with you. A case in point being Vladimir Putin’s government, who were seemingly aware of, and have possibly even collaborated in, the apparent systematic cheating of Russian athletes at the London Olympics and other major athletic meetings over a number of years. It looks more than likely that there are other nations too, with skeletons to hide. Finally, what of New Zealand? Have we too been infiltrated on these shores to any degree by organised crime in sport? It is very unlikely to be much or perhaps if at all, but would we not be naïve in the extreme to think that we could be immune to the lure of dirty money also?